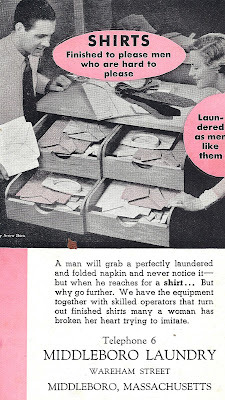 If one believes this wonderfully dated piece of advertising from the Middleboro Laundry, the local 1950s housewife "broke her heart" trying to iron the perfect dress shirt for her hard to please husband. 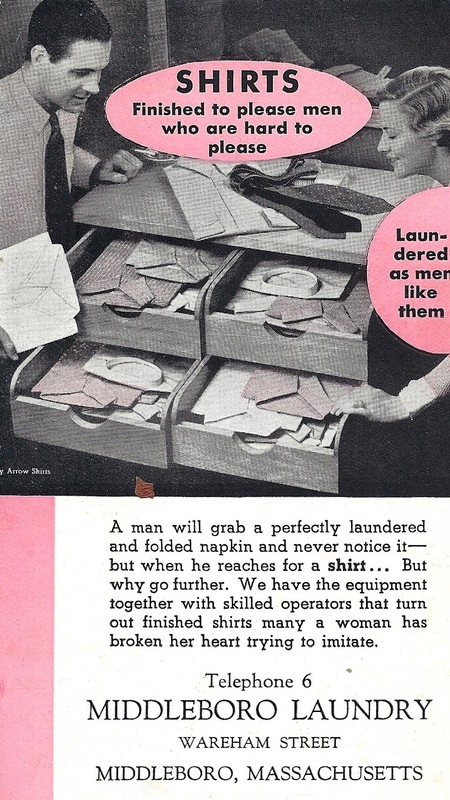 In despair, she no doubt turned to the services of the Middleboro Laundry. Here her husband scrutinizes the work to ensure it is up to his exacting standards while in the meantime enjoying a cigarette (which rests in an ashtray near his left hand). Compare this with a circa 1880 Victorian trade card from the George H. Doane Hardware Company and you will see that the lot of women had changed little in the intervening 75 years. The Middleboro Laundry succeeded Swift's Wet Wash Laundry in 1925 and was owned after 1926 by John Grantham. Located on Wareham Street at the Nemasket River, the firm operated throughout the mid-twentieth century as Middleborough's leading laundry.